This last weekend, I drove for eight hours to the Chautauqua Institution in order to teach at a wonderful conference. When we booked the event in April 2008, I just thought to myself “upstate New York” and didn’t think of the true distance. Gads. The place is almost in the waters of Lake Erie!! The drive was long, especially with lots of stops, but quite beautiful. Autumn is my favorite season, even if it came too early here in Amherst. There were storm clouds most of the trip, but little rain. Somehow colors are more vivid with dark clouds instead of intense sunlight. Because I started before eight in the morning, I was able to view the local color as I moved across the state. I knew I would be writing this blog installment (my final one) upon my return, so I looked specifically for things I thought beautiful. Then I was going to search for the right words to convey that beauty, much as the Japanese have a vocabulary to evaluate beauty. Upstate New York is largely agricultural, so it was not unexpected that autumnal color was the first item on my list. There were long, long fields of corn. Sometimes they were so close to rural roads that the scene felt like a maze! The corn was tall and the stalks golden….think the musical, Oklahoma. The fields were magnificent because of their sheer size and consistency…all golden, all the same height, all packed closely together. The sod farms were the opposite. They were so lushly green and flat, they felt like giant carpets that would be transported to golf courses and expensive, exclusive condos. They were so evenly green, they seemed artificial. Maybe it was the light. Believe it or not, after awhile, I tired of the fall colors. Hill after hill of largely gold and orange leaves became boring. They reminded me of those zigsaw puzzles my sister and I labored over. You know the ones – you get the outside borders done and all the remaining pieces seem interchangeable. That was the way those hills looked. Then here and there, a vividly red tree would be nestled next to a farm house or mark the end of a field. I slowed down and looked more closely. Of course, not everything was horticultural. I loved the collapsing barns invaded by vines. Old silos silhouetted against the skyline or paired with barns. I saw rusty farm equipment left behind at the edge of fields or hidden from view by sheds. There were red-tailed hawks sitting in barren trees and black angus steers seemingly painted into the landscape. There were old signs and billboards announcing Howe Caverns, obscure museums and products no longer sold. I passed over the Erie Canal and saw near the highway some of the old locks used to advertise. As I moved along, I was thinking about the vocabulary I would need to describe what I had seen – the colors, the light, the rust, the lushness. I came to the conclusion there is no single vocabulary for such descriptions. In order to bring these images to life for someone else, I would have to use whole sentences, whole paragraphs. This realization brought me back to Japan, surprise, surprise! The Japanese have a large vocabulary that is used to evaluate and describe beauty. 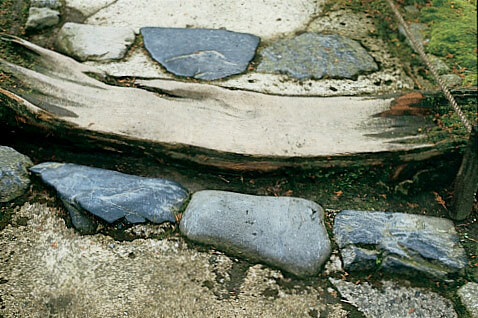 Many have heard the term “wabi-sabi” but few understand its true meaning. Even fewer can identify items that qualify! I have often heard the terms used confidently…and incorrectly. Harumi-san, my Tokyo antiques’ dealer friend, said her Western friends would often ask if they had selected a piece that was “wabi”. Gentle Japanese woman that she was, she couldn’t say no, she just smiled a bit and gave a little shrug of her shoulders. What appeals to me so much about this special vocabulary that describes beauty is how clear these single words are to the Japanese. If someone says a kimono is shibui (severe good taste), a Japanese woman will know what that means. If a tea master says a bamboo flower holder is wabi (naturalness, simplicity), the participants understand. I still have difficulty with these terms, and my very simple descriptions here attest to that. However, I have discovered what I love to look at in Japan and what qualifies (for me) as beauty. Sometimes I can even apply the vocabulary – wabi, sabi, shibui, jimi, hade and more. I don’t think I can apply that vocabulary to upstate New York – at least, not yet. In my own work, I have used one of these terms only once – “Sabi Tea Jar” series. Sabi means rust in Japanese, in addition to its wabi-sabi meaning, the natural patina of age. I twined this series after being inspired by the water jars used in tea ceremony. I would see the old, sometimes rusty ones at flea markets, and I loved both their distressed surfaces and the textures. I often used old iron lids to close off the basket, further connecting the piece with both its inspiration and the multiple meanings of sabi. Barry Lancet, my Tokyo editor, once told me that it would be easy for me to plagiarize myself when writing about Japan. Eight years after the publication of Bamboo in Japan and numerous articles later, I realize just how wise a warning that was. 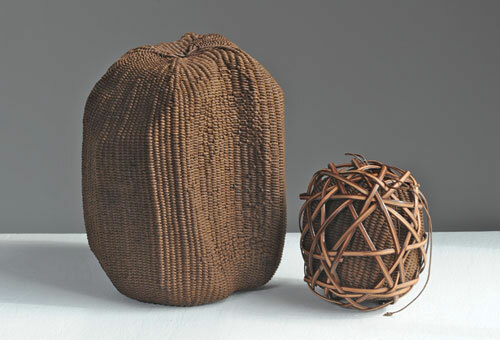 Japan has influenced my work in many ways, but they all overlap – traditional packaging, basketry, bamboo, the crossover influences of East/West, the vocabulary of defining beauty and craftsmanship. And, I find that I do not want to stop discussing those topics and how they relate. I’ll just be careful and try to discuss those topics more fully and from different angles than previously. The fun part of contributing to a blog is that the writing can be more spontaneous (I dislike editing and the copy/paste approach to writing is exhausting), and there is no need here for my writing to have a rigid chronological order. So this version of my Japan story does not begin with the book, How to Wrap Five Eggs, nor with our first trip to Japan in 1986. Wow. What a long time ago! Some of my work is very obviously influenced by my time in Japan. Even the titles give it away – Kappabashi Street, Asian Roots: Jakago-Snake Basket, Katachi/Form, Harmony in Ritual: Forms from Tea Ceremony. Other basket series, such as Sabi Tea Jar, incorporate elements I purchase at flea markets and antique bazaars in Japan. Increasingly pages from old Japanese books are part of my work, often producing a “skin” over open-weave bamboo and cane. Some of my work is presented in wooden Japanese boxes – Boxed Packages and Five Variations on Two Themes. After seeing multiple fan skeletons hanging from the ceiling, multiple baskets stacked before being lacquered, multiple boxed baskets arranged in a gallery, I am more interested in producing related pieces and boxed sets of baskets that can be moved about and changed. I find there is something incredibly and powerful about multiples when presented together. Some of the effects of living in Japan are more subtle. For example, after watching basket makers and other craftspeople work uncomplaining for long, long hours, I am more patient and precise in my work. Even my commercial work became less burdensome and more productive. I whine less often about the light, the height of my work tables, and the comfort of my chairs. I don’t crave someone else’s splendid studio, I just crave more tables and more time. Increasingly, I am willing to think of very long-term goals and satisfaction. There are little tricks that let me feel Japan when I am working on pieces that I want to reflect Japan. Sometimes I flip through books describing various aspects of Japan or my own, Bamboo in Japan. When I do the latter, I remember details of each interview, the sound of bamboo in the wind on the Island of Kyushu, and the smell and taste of the grilled onigiri rice balls the kite maker’s wife gave us for lunch. I remember walking down a country road in Chiba 1996 with time to saunter. There was a farm house that had root vegetables drying in bamboo baskets on the veranda. I stuck my head in the door and said Sumimasen…excuse me. May I take a photograph of the drying persimmons hanging from your eaves, please? The resulting photographs are among my favorites…a small bee was darting in and out, the persimmons still smelled sweet and juicy. They gave me a cup of green tea before I headed back to the country bus stop. I remember the day described in the introduction to the section “Crafts in Japan” with great fondness. The metalsmith and the basketry teacher sat near the fire eating mikan oranges. What great memories. I read a few more pages and then I am ready to work. Sometimes looking at books and images, or studying Japanese isn’t what I need. Often, then, I turn to music. 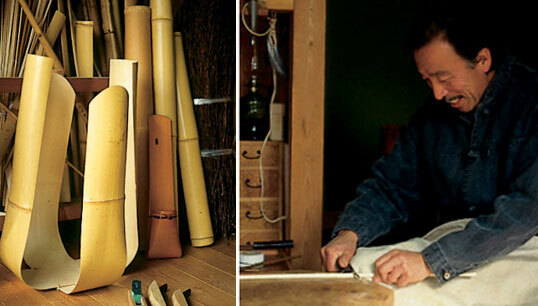 I am partial to John Neptune’s shakuhachi CD’s and can listen for hours. Rarely do I listen to vocals when working in the studio, but occasionally, I listen to a choral group (Japanese Voices) sing old Japanese folk songs. Think of the music in the old movie Sayonara with Marlon Brando. If I add a bit of Yo Yo Ma (I think it may be his engaging smile as much as his Silk Roads music! ), it is for variety. When working in the studio on other work, especially when experimenting or producing workshop samples, I’ll turn to Philip Glass. Do so love his CD with Ravi Shankar especially. I cannot live and work without going to Japan. Sound overly dramatic? Too bad – that’s the truth of it. Japan is such an integral part of my life (not just my work life) that my definition of myself is incomplete without it. Whenever my bank account reaches a certain level, I start to make plans. I cannot wait until the next trip. **Truth in advertising – I have used this title before and have lent it to one exhibition. It was not my idea to carve industrial foam. It was my artist friend, Lorrie Fredette, who suggested it, and it was she who gave me my first block of foam. We had been talking about the tendon damage in my thumbs, the result of 30-plus years of twining. I had already found that by twining over a vase I liked (learned the technique for tying the basket base on from an Irish rushcraft book), my right hand did less work. The vase gave me something to push against and my right thumb was less active. Clever Lorrie suggested carving my own forms. She had been using foam when constructing theater props. A week after the conversation, a giant block of industrial foam arrived via UPS! It took some time to discover which tools worked best. I have settled in with my serrated bread knife, a Stanley scrapper, some rasps and my trusty Dremel. Recently I learned from Monica, a Haystack workshop participant, that I can use a scrap piece of foam to shape and smooth as easily as a rasp. What a great tip. I have also learned to carve in the garage while wearing my oldest gardening clothes and to leave time for a quick shower when I finish. Boy, does that foam dust itch! In workshops, we set up a separate carving station and cover the surface in an old sheet to isolate the bits and pieces and make disposal easier. At Haystack, because everyone is so aware of the fragile environment, we carved over restaurant busboy trays. We enclosed everything before it could fall through the cracks in the decking and onto the moss, AND we followed up with the shop vac. Before painting several layers of gesso or acrylic paint (similar in color to the twining materials), I always use a damp sponge to wipe off the final layer of dust, and if the vacuum is close by, I’ll use that first. Before I start to paint, I draw an outline of the form’s base on the top of a file folder as a record. Since I often want to start the twined base before the paint is dry, I need to know what size and shape the form’s base is. I paint the bottom half of the form first, and when it is dry, paint the top. After two or three layers of acrylic (this prevents the foam from chemically interacting with the twining materials), I can begin twining on the form itself. However, getting the twined base to echo the carved indentations of the foam is a real challenge and great fun. You’ll get the idea when you look at Animistic Spirit: The Supernatural in Japan or Glacial Planes especially. I am not describing a circular base! The first few pieces I sent to browngrotta were simple bridge forms, and I still love those shapes. I wanted to experiment with color and texture, but I also wanted to make no references to vessels. This series of carved forms was to be ALL about mass and not volume! Although I loved the original colors of the waxed cotton that were then available, I did not want to be limited to solid colors. With color variation in mind, I stretched out long pieces of waxed paper (did you know they still make this stuff?) on top of the washer and dryer in my laundry room. I like to work with weavers about 40”, so I cut a couple dozen lengths and stretched them across the horizontal surface. With diluted acrylic paint on my dollar store paper plates and a foam brush in hand, I went to work making color magic. Everything dried outside on old wire coat hangers hanging from the clothesline. They looked quite cheerful swinging in the breeze! In the studio, I would just select randomly from the painted and dried cordage. As I became more confident with the carving, I looked elsewhere for inspiration. The first white piece, Shiroi Katachi – White Form was inspired by a modern light fixture made from bamboo and white paper. I loved the flowing lines…each echoing the previous one like ripples in water. Animistic Spirit: The Supernatural in Japan continues to be one of my favorites. I was inspired by Yoshitoshi’s ghostlike figures in his ukiyo-e prints and by the writing of Lafcadio Hearn who loved ghost stories and other strange things. Do you see the figure in Animistic Spirit? It is a running rabbit, but you have to look closely. It was a challenge to have the ridges formed by the spokes follow the carved lines from one end to the other. I used a variation of twining to produce “knots” that emphasize different parts of the figure. This is a technique I developed years ago when doing a commercial handbag sample. I continue to incorporate the technique in much of my work. On these sculptural pieces, the texture is especially effective. Of course, my last carved piece is usually my favorite. I had contacted the Elliot Foam of Indianapolis company and asked if they had higher-density foam so that I might experiment with sharper, crisper edges on this next piece. They generously sent me samples. After making a gouge line in each, I selected a higher-density foam (06 level) for this project. It took them some time to find a block small enough for my kind of work – this is an industrial product after all. Finally there arrived two large boxes (over six feet long each) with a block of foam in each. None of our saws were large enough, nor the blades deep enough to cut a block into usable units. So, we drove them to the lumberyard in our pickup, and a gentleman there cut them with his chainsaw! This foam is MUCH more difficult to cut with hand tools and the T pins that hold the woven surface tightly against the foam are much less enthusiastic about their new jobs. However, hours and hours later (don’t ask), I am so pleased with the result of Glacial Planes. I wanted the harder edges to be maintained. I was inspired by the multiple patterns often seen in kimono fabrics, though this sculpture makes no reference to torso or to kimono. There are small areas of knotting, and even one of twill. Long, smooth bands of plain twining emphasize the carved planes and rest the eye before the next band of texture. Keeping some of the spokes two and three elements wide added even more emphasis to the edges of some planes. It is all about quiet variations in a gentle color. Don’t you just love a challenge? If I hadn’t spoken with Lorrie, I might never have gone this direction. What might have been considered a limitation (injury), actually resulted in a positive expansion of my work! I am now dreaming of the next piece, and I think it will have multiple parts. Working on the two pieces of Kaki Shibu was a pleasure, and I would like to continue with multiples. And the inspiration….who knows??? Let me start by saying this is not a review of an exhibition. 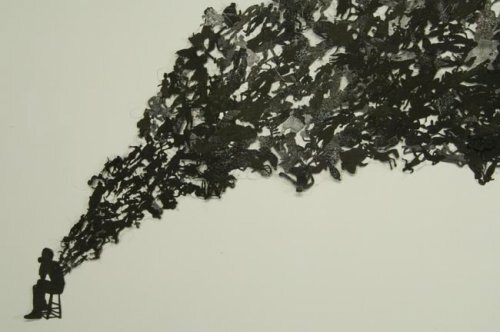 I do want to discuss this one specific exhibition, I Heard a Voice: The Art of Lesley Dill, and how it relates to my work and my decision-making process. There are many reasons why I go to exhibitions as often as I do. I never stop looking for inspiration, a new working vocabulary, a different perspective and, sometimes, just “mechanicals” – new color combinations, techniques, materials, etc. Regardless of the reasons for seeking out artists’ presentations, I was lucky to live in New York City, where galleries and museums abound for 24 years. Now I live in Amherst, Massachusetts which is part of the Five College area. Multiple campuses mean lots of bookstores and book events, and a surprisingly large number of museums and galleries. Before I continue, in fairness I should reveal that I am predisposed to have positive feelings about an exhibition that travels, especially one that travels to college campuses and art centers. This exhibition was organized by the Hunter Museum of American Art in Chattanooga, Tennessee and will travel to five more venues. I am excited to think how many people (including many, many students) are going to view/enjoy/discuss this work. I saw the exhibition at the Smith College Museum of Art in nearby Northampton. I loved the intensity of the conversations I overheard, some in response to the video of Dill at work. I couldn’t help myself….I watched it twice. Dill’s work is about words. She tells you so herself that “language is the touchstone”. But until I saw the work itself, I didn’t realize how literal this comment was. Words were everything – cut out, stitched, and painted. Words were pattern, inspiration, exploration, memory and quotation. As a result, her work has a singular voice and each individual work contributes to the impact of the whole. As I mentioned, this blog is not an exhibition review, but I do want to share some of my personal observations before I discuss the relevance of this exhibition to my own work and work style. 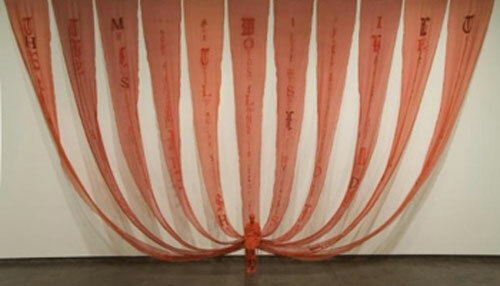 Rise was a show stopper with its red banners and large lettering drawing the eye to the equally red, wrapped contemplative, Buddha-like figure. I preferred the piece as seen from the staircase – the banners became giant graphics! Dress of Inwardness was another piece in which the presence of words had almost staggering impact. I found myself searching to read and analyze. It was to me a fragmented SHOUT! But of all the work exhibited (there were reportedly 35), it was Rush that I went back to again and again. There is a small, seated figure (2D) almost in the corner of a huge wall. The catalogue said it was constructed of silver leaf, organza and wire and from a distance it was in varying shades of grey. Gushing from the back of the figure and crossing sixty feet of the wall were overlapping pieces of material – ideas, thoughts, view points? It was as if the figure simply could not contain all of the interior monologue. Dill had paired several pieces with powerful quotes, and I regret I didn’t write down the one relevant to this piece. I will have to be content with my own response. But that is the way it always is, isn’t it? We don’t want the exhibition signage or catalogue, no matter how well informed, to tell us how to view the work. Look, respond, then read is my motto. So why am I still thinking about this exhibition and this Brooklyn artist, Lesley Dill, long after I saw the exhibition? She made me think about her approach to her work, the why of her work for her. She is introspective, full of thought and dedication. She has a voice – in my mind a complex, but focused voice. Her work made me think more about my work in a different way and that made me think about how and why I work. Once again, I realize that I tend to let the momentum of my schedule and its multiple deadlines dictate the flow of my work. I don’t often enough take the time to really decide my next step. And I often look outside myself, rather than within. So I am wondering now, if I had a large collection of my work in an exhibition, what would be my voice? Would such an exhibition have a theme of “other people, earlier times” – emphasis on Japan? Would it be about “layering of two cultures” as one writer suggested? Or is my body of work too fragmented to make a powerful statement? After 38 years of making, it is fine with me to be asking these questions again. I have years left to work and I want to be more thoughtful with my studio hours and my research time. In the end, I may continue with the series I currently love, or maybe not! Thanks for the stimulus, Lesley Dill. It resulted in my realizing that continuing to ask questions may be more important than resolving the answers. HAYSTACK – RENEWAL – MAGIC! There are inspiring locations I remember with considerable fondness – Kilkenny, Ireland; New Delhi/India; and many, many places in Japan. For all of these, I can close my eyes or listen to specific music and draw forth the images I want. Closer to home, there is Haystack Mountain School of Crafts on Deer Isle, Maine. Since returning from there at the end of August, Haystack (as it is affectionately referred to by many) has wandered across my mind daily…sometimes more than once. Over the years, I have tried to analyze just why Haystack works so well for me and many others. Probably I am hoping to duplicate some of its “magic” here at home. There are other, notable retreat teaching sites that possess similar attributes and offer parallel craft courses —Penland, Arrowmont, and (on a smaller scale) Peter’s Valley, North Country Studio Workshops and more. But what is it about Haystack that sets it apart? The site – Deer Isle is magnificent with a wild coastline and a true fishing community. There is a sense of isolation once you are there and that feeling is very conducive to focusing on studio work and community. With only a couple of small towns, no major shopping, bad cell phone reception (I had to stand in one spot in the parking lot, facing west! ), and no radio or television, etc. there is little to distract, other than the beauty of the place. The campus itself – designed by Edward Larrabee Barnes, it is recognized as a landmark by many, including the AIA. But when I drive up the final leg of the trip on that dusty road, drop off my supplies and drive back to the top of the hill to park, I am not thinking about the design or the architect. I am anticipating that first walk up to the main deck and the view from there. I am wondering if the tide is out and if the lobster boats are done for the day or just beginning. I am hoping I can view the bay from my room and my studio, I am hoping it doesn’t rain too often so that I can be outside. Of course Barnes is responsible for my anticipating all of this. He had a plan. The buildings – so simple, aging so gracefully, sitting so gently on the land, they require no exertion on my part. I am not the maintenance crew, nor the chef. There are no rugs to straighten, sometimes no curtains. There is just time to work, talk, share, dream. I can sit in front of the fireplace at night, or in the studio or with others in front of the glass Hot Shop…a much better than television. Atmosphere – none of this happens without lots of behind the scenes work all year round. Stu, of course, sets the tone, with his gang of a zillion in the background. From his announcements at mealtimes, his poetry reading, his running jokes about weather and the septic system (who knew this could be funny—over and over again? ), I see his hand everywhere. Each session is carefully framed so that the offerings are rich and varied. Even when I am not going to Haystack, I read the catalogue carefully. Haystack’s increasing outreach programs to the community enrich everyone, including the workshop participants. I realized this year that Haystack seems even more grounded than ever. Why now – it was a tough year for me with health issues and health issues always reach into the studio and trample creativity. But I was determined to make it to Haystack, and I will be eternally grateful that I made it. Armed with heating pads and pain meds (and Jennifer, the fab teaching assistant who helped with all things physical), I was so ready to be there. And I was rewarded (that is the correct word) with fascinating workshop participants, really interesting instructors, great food (way too much whipped cream…Tom’s berry fool! ), time to walk, think,design and be stimulated by others. There were poetry readings in the old Opera House and an opening at a gallery in Stonington, an open house party and gallery openings in Deer Isle. I’ll remember especially a basket Stephanie wove and filled with rocks. Chayle had wanted to do a basket installation on the rocks at the edge of the bay and Stephanie volunteered her basket. They tried several spots, finally selecting one in which the basket was wedged between rocks and was covered by high tide. This basket style, open-hexagonal weave, is one of my trademarks and refers back to the Japanese and Chinese tradition of using this pattern in bamboo to wrap large stones at water’s edge to prevent soil and coast erosion. It was perfect here. In groups and individually, we hiked down over the rocks to watch the water cover it and uncover it repeatedly. Each day now I wonder if it is still there or if it finally washed out to sea. On the day I left, I got up early to say good bye to the first person from my workshop who was leaving. Afterwards, I stood with coffee overlooking the bay and watched everyone drag suitcases up long flights of stairs and make their goodbyes. I went back to the studio to say good bye to the space and the light. I wasn’t quite ready to leave and spent more time there than expected. Then I drove to Stonington and walked around, gathering images of lobster boats and fishermen. As I drove over that bridge back to the mainland, I was wondering when I would get back there. A seven-hour drive prevents it from being a spontaneous visit, but the place has a way of making me want to be there. I stopped in Searsport at a favorite bookstore and chatted with the owner about his forthcoming trip to Japan. The separation from Haystack and Deer Isle had begun. Part of my mind was at home and on the daily routine that would take over sooner than one likes. Drove past Portland, ME and Portsmouth, NH, both favorite cities and I knew the separation was complete. Back at home, I couldn’t wait to get into the studio. I didn’t care about the pain (part of the time, anyway), I didn’t care that deadlines were pressing, I just WANTED to be there for the first time in several months. I haven’t stopped working since. Haystack’s magic for me is that it offers an opportunity to be renewed, to refocus, to be renewed, to reboot…whichever re word comes to mind. My hands and mind are back together and there is great pleasure again in the making process. Oh, you got it so very right, Nancy. When I read your words I can finish your sentences. I can see the dining room, people lugging suitcases up those steps, the empty studio at the end of the session. I can hear the bell calling everyone to meals, the lapping of the water on the rocks, Stu making the weather better through his witty comment. I’m there with you. And what makes it really work is the teachers and students who arrive every two weeks to inhabit the physical place and bring it to life, each time a little differently, each time with a new sense of possibility. You and your fine class of basketmakers are a part of the magic! Deer Isle granite ledge makes a perfect setting for the rocks within the hex basket. Imagine someone coming upon this as an unexpected find and their resulting delight. Both photos, dry and with water, prove that additions to nature can enhance our appreciation of our surroundings. I hope this installation lasts a long time. Thanks for doing the work and for saving it in photos as well as words. Reading anything Nancy writes is always a pleasure! The grace of her writing is only matched by the beauty of her work. I am a fan of both. Nancy, your writing is gorgeous, and you make me so very nostalgic for Haystack. Your descriptions bring it into immediate focus. I can almost smell the berry fool baking in the kitchen and hear the waves wash over the hexagonal basket filled with rocks. It is all so inspiring and nurturing. Thanks for putting it all into words. What a great treat to read your entries, Nancy! They are so beautifully written and so insightful. The magic of Haystack comes across so loud and clear. And I would have loved to have been there to share your experience of viewing Lesley Dill’s exhibit. Can’t wait for your next blog enrty! Nancy it was a pleasure to read your blog about the Lesley Dill show. I was so taken with the work that I joined the museum in June and went back five times over the summer!Your thoughts have captured the compelling nature of being able to view so many of Dill’s works together. I found the video a remarkable addition, giving me sufficient insight to go back and look more closely at many of the sculptures and rereading the poems that inspired each work. Thank you for taking the time to describe the power of this show. Having read your blog twice, separated by several days, your comments, Nancy, about the beauty and “magic” of Haystack reinforces my hope and desire that both my husband and I can enjoy Haystack together. Such an inspiring environment offers numerous gifts of learning that Haystack provides to all its participants. Learning for us is not only what the class topics provide, but encompasses the natural setting, the native organisms, the action of the waves upon the coast, and the light and its effects on the ecosystem surrounding Haystack. Communicating with fellow students, staff and teachers is always a learning and meaningful experience. Each year, we look at Haystack and each year we are coming closer to enjoying the gifts that Haystack will give to us. Thanks, Nancy, for your wonderful remarks that make a dream we are looking forward to sharing together come true.